Other Products by Body Science. Search other Digestive Health products. 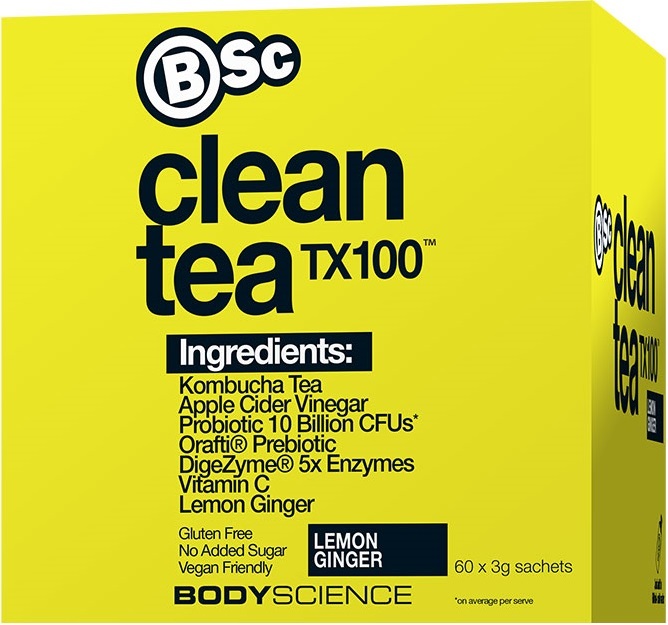 Bodyscience Clean Tea TX100 is a unique blend of beneficial cultures, prebiotics, apple cider vinegar and digestive enzymes. And it's all about digestive health! After all, this process that we take for granted is pretty darn important for maintaining general health. In fact, our digestive system may be the single most underrated process for boosting vitality and overall wellbeing. No exaggeration folks. And it's easy to overload this system too, given the amount of food we eat in developed nations, our eating habits and also the rich and complex nature of that food. That's where Bodyscience Clean Tea TX100 steps in to take care of business. This product delivers two-tiered cultures, in the form of standardised probiotics and 100% RAW KOMBUCHA tea. Kombucha is the ninja of the culture world, delivering an impressively broad range of naturally occurring beneficial bacteria to support general digestive and immunological health1,2. You see, the thing is, our digestive tract needs an incredibly broad range of protiotics in order to keep us healthy. It certainly doesn't come down to 1 or 2 strains, or even 10! There's more to it than that. These little guys really do work for us in keeping digestive health moving forward. 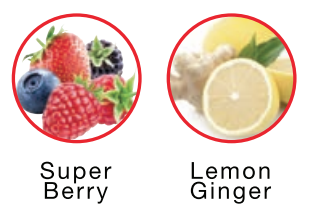 The beauty of Kombucha is that it also has a very broad range of cultures. 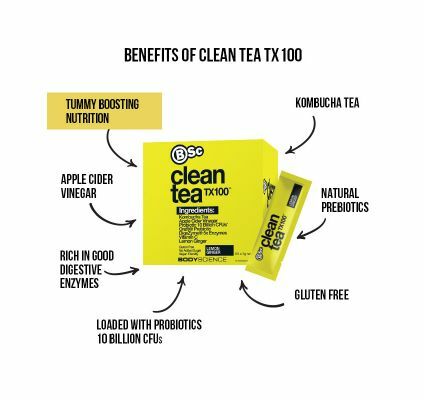 This means BSc Clean Tea TX100 is taking us well beyond a standard run-of-the-mill acidophillus and bifidus product, like the ones that have lined the shelves of fridges in health food stores and pharmacies for decades now. Apple Cider Vinegar is another superhero-like ingredient found in BSc Clean Tea TX100. If it had a cape, it would be made from threads of 24-karat gold. This is an awesome remedy that has been used since 5,000 BC, which is over 7,000 years ago. Yikes! Vinegar has been used as a remedy for stomachache, high blood sugar and countless other ailments, demonstrating this natural medicinal agent to support the body in a range of different ways3. Bodyscience have put together another fantastic wellness product that can be used by sports and exercise enthusiasts or anyone wanting to improve general wellbeing. Oh yeah ... it also tastes refreshingly fantastic! Mix 1 sachet into 600ml cold water and drink. INGREDIENTS: Kombucha tea powder, Apple cider vinegar, natural lemon flavour, ginger powder, OraftiR Inulin, Ascorbic Acid, Citric Acid, Stevia., Thaumatin, Lactobacillus acidophilus 200B, DigezymeR enzyme blend (amylase, protease, cellulase, lipase, lactase).